On behalf of City Mazda and its loyal customers we are excited to present The Canadian Red Cross with a cheque for $5100.00 to go towards relief efforts in Fort McMurray. We were fortunate to have a visit from our Mazda Japan and Mazda Canada office. 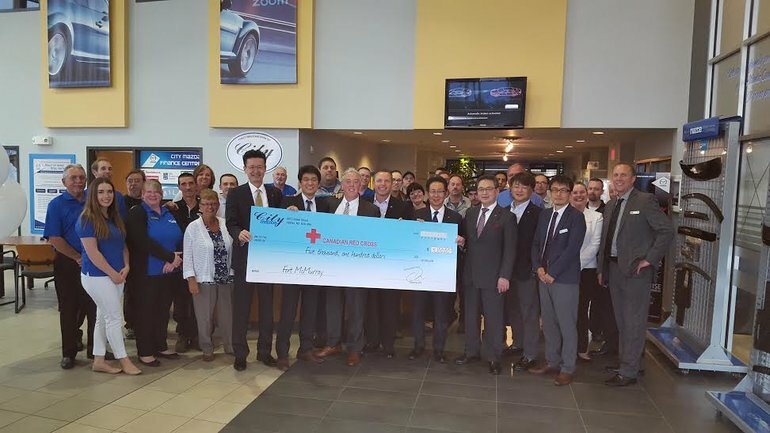 The President and CEO of Mazda Canada, Massey Kondo and Steve Scarff, Owner of City Mazda along with City Mazda staff and other Mazda dignitaries proudly display the donation.